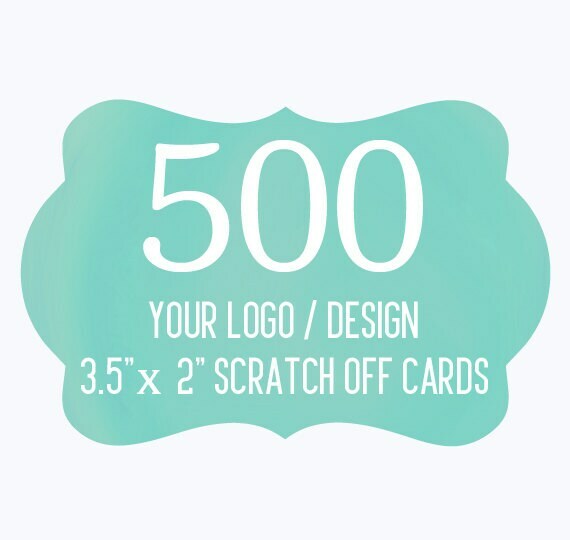 500 Custom Promotional Scratch Off Cards. Your purchase of 500 cards will come with 5 different variations. I received my items well before the ship date which was great. However upon arrival the word "mystery" was spelled wrong and was missing the y. I checked the proof and saw that I had missed the spelling as well. I was told because I approved the proof that there was nothing that could be done other then paying at a discount to get the cards redone. I declined as I had already spent a pretty penny for the ones I have. Owner refunded me 1/3 of what I paid due to me declining. Make sure that you read your proof 100% percent. When I checked mine, I was looking at my logo and shops link. I didn't think I had to check for the words she placed on there to be correct (isn't that what spell check is for). Other then having 500 cards misspelled, the quality is great.